This webpage is dedicated to the FOX News pundit George Will. He is famous for transporting and possessing stolen property, President Cater's debate book, and using it to coach Ronald Reagan. He is also famous for his pathological lying about climate change. There are many articles that describe in detail how George Will lies. Norman Solomon | George Will's Ethics: None of Our Business? 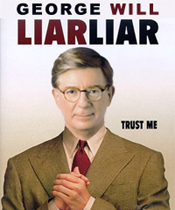 George Will can't stop lying!